Family: Birth obscure. ? born AD60 to unknown parents, putatively in Britannia. Formal adoption c AD77 by M Didius Falco, an equestrian, and Helena Justina, d of senator D Camillus Verus and sister of senators A Camillus Aelianus and Q Camillus Justinus. Eldest of four siblings. Marriage 1) Ti Lentullus, known to have served in Germania with legio I Adiutrix (Flavian creation formed of ex-marines), later thought to have had Q Camillus Justinus as a patron, d ? AD80 in Rome. No children. 2) Ti Manlius Faustus, plebeian aedile in AD89 (m1) Laia Gratiana, ? sister of a plebian aedile of AD90). Wedding mentioned in the Acta Diurna, curiously in its miracles section. No children recorded. Career: Few definite sightings in trustworthy annals, though scholarship is ongoing. For a woman of the imperial period lack of historical mention is unsurprising. One possible reference involves the Domitianic so-called ‘needle-killings’. 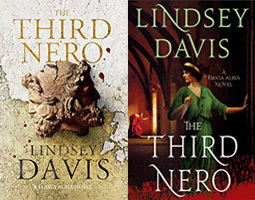 Current research suggests she may have had association with the intelligence services; but despite family connections to M Didius Falco (a favourite agent of Vespasian) and the frumentarius Fulvius (tentatively identified as active in Dalmatia and Egypt), for a female informer of the period this seems unlikely. It has been argued that her skill as a delator may itself explain why she is rarely visible. Publications: None identified. Her voice has been putatively identified in fragments of scabrous election oratory from the Domitianic period, though some scholars believe this must be spurious.